Over the past three decades, the childhood obesity rate has more than doubled for preschool children aged 2−5 years and adolescents aged 12−19 years, and it has more than tripled for children aged 6−11 years. At present, approximately nine million children over 6 years of age are considered obese. Between 16 and 33 percent of children and adolescents are obese. Statistics show that obese children and especially those in the teenage years have a 70% chance of being obese as adults. What is worse is that percentage increases to 80% if either one or both the parents are obese as well. In 2009, Dawn Strozier founded The Fight Against Obesity Foundation, a 501(c)3 organization. Known as “the fitness queen,” Ms. Strozier is a celebrity trainer whose expertise as a nutritional consultant attracts a diverse clientele, including professional athletes, Hollywood executives, Fortune 500 corporations and high-profile celebrities. 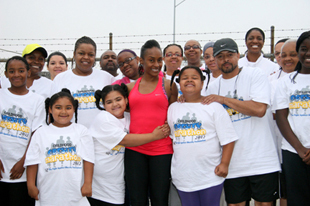 The foundation is committed to fighting the growing epidemic of obesity in our community. Since 2009 the Foundation has been an active participant in our local community promoting obesity awareness through a variety of fitness, health and educational services designed to create long-term health benefits. A child is considered obese when exceeding certain average height and weight parameters for their respective age. For example, a 2-year-old boy should have an average height of 31 inches and an average weight of 28.4 pounds; a 2-year-old girl, 30 inches and 28.4 pounds; a 6-year- old boy, 42 inches and 46.2 pounds; a 6-year-old girl, 41 inches and 46.2 pounds; a 12–13-year-old boy, 58–62 inches and 85–100 pounds; a 12–13-year-old girl, 60–63 inches and 95–105 pounds; and a 16–17-year-old boy, 67–70 inches and 130–150 pounds; and a 16–17-year-old girl, 64 inches and 115–120 pounds. On May 6, 2012, Dawn Strozier decided to run 26.2 miles in an effort to raise $26,000 on behalf of The Fight Against Obesity Foundation. Joining her along the way were The Kids of the Foundation, their parents, sponsors and members of The Aerobics Room. Over 70 people ran or walked in support of the event. Of the 70-plus participants, 80% were families who walked and/or ran with Dawn Strozier along portions of the 26.2 mile trek. Families participated in groups of 3 to 10. Each group/family ran one mile each. The run mirrored the route of the L.A. Marathon from Dodgers Stadium to Santa Monica. Along the entire route, spectators inquired about the purpose of the run. They applauded the children, asked to take pictures and even donated toward the cause. Although it was Dawn’s first attempt to create such an event, the marathon was a huge success. It was well organized and creatively designed to allow people who would otherwise be unable to run 26.2 miles to contribute their own personal one-mile commitment and towards a greater cause. Participants were very excited about their contribution and rallied around Dawn as she pushed through muscle cramps and fatigue to complete her very first marathon. The Foundation offers a variety of classes including free kids’ fitness classes, adult zumba, boot camp, cardio step, kick boxing and aerobics groove. Located at 3820 Crenshaw Blvd., in Los Angeles, The Fight Against Obesity Foundation/Aerobics Room is centrally located to bring health and fitness into our community. Dawn Strozier and The Fight Against Obesity Foundation can be contacted at 310-289-2169 or www.aerobicsroom.com.